The East Pole is well worth the trip even if you don't live in the neighborhood. Its name is a playful contrast to the North Pole, and also a nod to how they source local ingredients from Eastern New York. 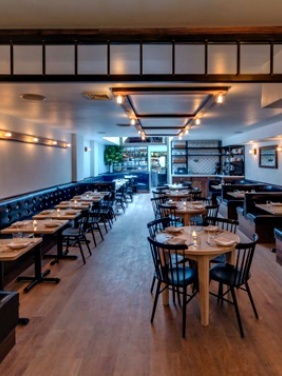 Inside you'll find modern, minimalist decor, and navy colored booths set against light-colored wood. Pro Tip: if you are a group of six, try to score the big round table in the back, perfectly situated under the skylight. If you are a larger group celebrating a special occasion, the upstairs space is great for a private event like a birthday, bridal or baby shower. Go for the Dutch Apple Pancake with Bourbon Maple Syrup, and for a side order the Scotch Egg & Mustard Seed. Most places over-fry their Scotch Eggs, but The East Pole nails it. There is also a Macro Plate if you are into something uber healthy.